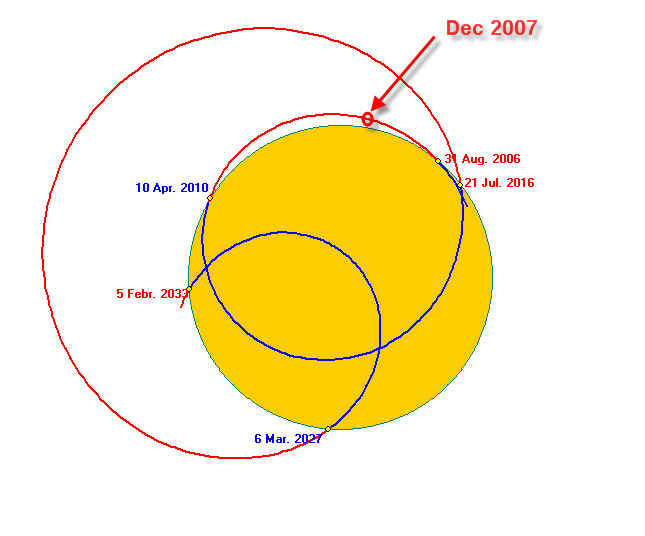 The yellow circle represents the Sun's disk. 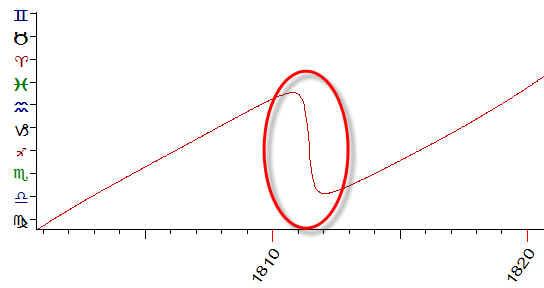 As you can see, sometimes CM dances just around of the Sun's photosphere (from August 2006 till April 2010 - a red curve). Then it dives into the Sun's disk and makes passes inside the Sun (April 2010 to July 2016 - a blue curve) and after that makes very wide figure outside of the Sun's disk. Is there any connection between CM moves and the stock market? If such a connection exists, we may use it to predict the future of the markets. In this small article, I will conduct a case study for CM and show possible ways to use this point to forecast different financial data. I am not a pioneer here; I only continue the work that has been started by Theodor Landscheidt and is described in his excellent book, "Sun-Earth-Man". Who are the major performers of this dance? First of all, this it is the Sun itself. It possesses 99.8% of the mass of our Solar System. It keeps our dancer (CM) totally under its control, allowing them from time to time to make the figures outside the Sun's photosphere. Second player is the heaviest planet of our System, Jupiter. 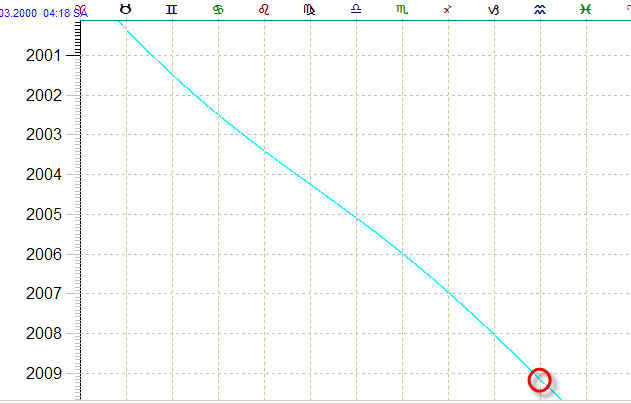 Jupiter dictates to our dancer its 12-year rhythm. This is important as the rhythm is very important issue for dancing. Saturn and Neptune, the next heaviest planets, add a variety to this dance. They add the sense of the art to this dance, otherwise the dancer will be just running rounds. Other planets add some nuances visible mostly to the professionals. Occasionally or not, two years after 1811 the Napoleon Empire ceased to exist as well as the Communist regime in Russia (two year after 1989). Now let us look at our dancer pairing some financial instrument. It looks like the CM has some impact on Consumer Price Index (CPI). I have the CPI data for Great Britain. The data used cover a period from 1666 till now. 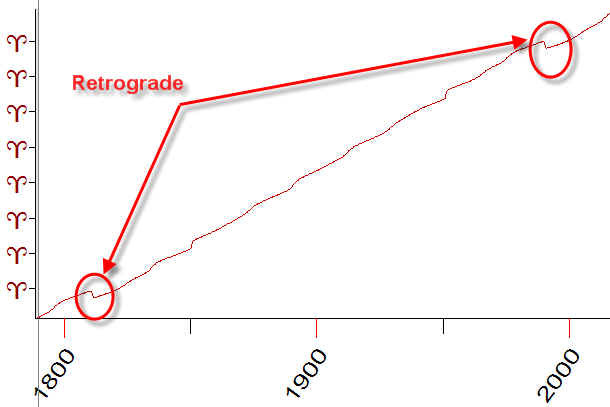 In some book, I have seen a diagram for that same index, starting from the year 1450. Unfortunately, I do not have these data and would be happy to get it. I would like to mention also that this research is NOT an illustration of some econometric theory. I simply look at these data from the point of view of mathematics and astronomy. IMHO this is caused by the fact that money and gold have been separated at this time (Bretton Wood conversion has been abandoned). 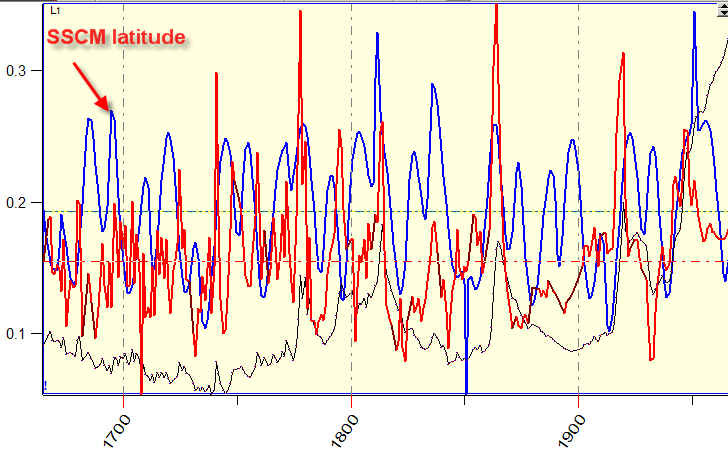 So I conduct the statistical research for the data from the year 1666 till 1950. 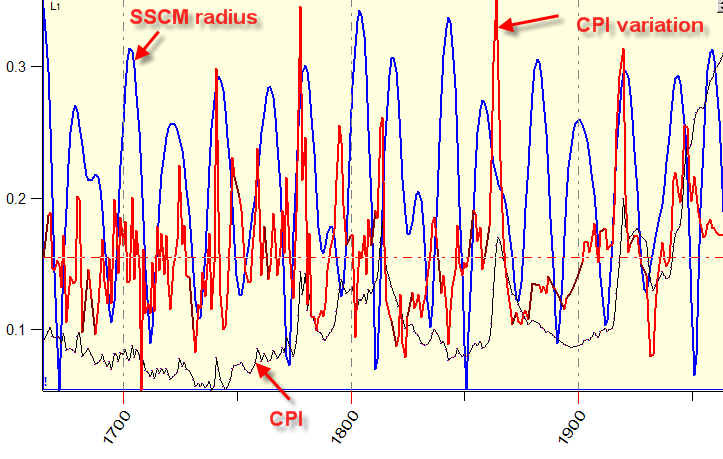 As you see, there is some coincidence between the blue (CM) and the red (CPI variation) peaks. It is not ideal; however it is present. The mathematical analysis shows that these two diagrams (CM radius and CPI) correlate to each other, and the correlation coefficient is 11%. 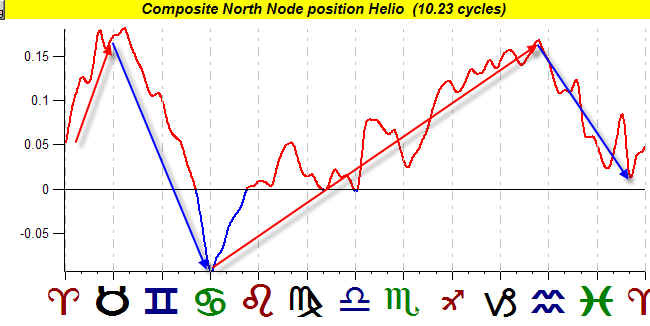 It means that the further CM is located from the Solar center, the higher inflation we have. When the dancer is under the Sun's control and makes some figures dancing inside the Sun disk, the inflation tends to be smaller than at the times when these figures are performed outside the Sun. The correlation now is about 30%. It means that these two factors are related with a high probability. Practically it means that the higher CM is inclined to the Ecliptic, the higher inflation we have. 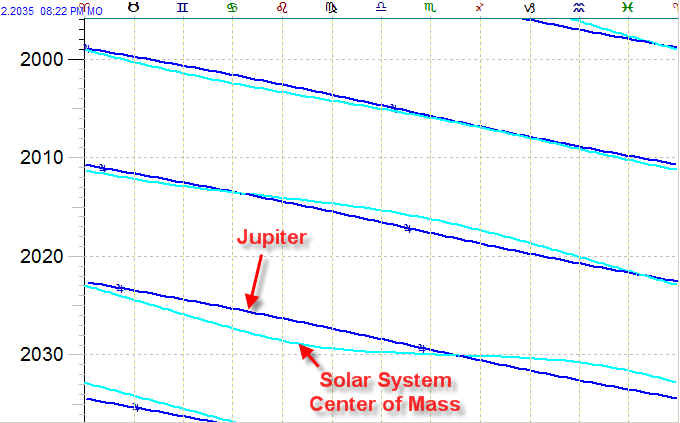 I think we can improve these results using Jupiter Ecliptic instead of the Earth's Ecliptic. 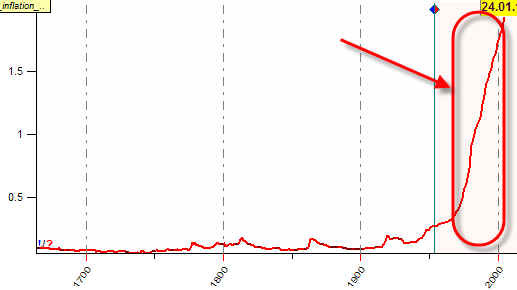 At least two years already I have seen many forecasts regarding the coming hyperinflation for the next year (it was said about 2006, 2007, and 2008), predicting the gold price at $2000 and the oil price at $200, together with many other terrible things. I believe and hope that all war/economics/liquidity problems will be solved smoothly, the Cosmic weather gives us some chance for that. Once again, remember that this is not an econometric analysis, it is the analysis of only one factor, CPI for Great Britain - because of the available long term data. Other inflation related indicators (like PPI, M2 index) simply have not enough recorded history data to make any long term forecast. This object has no relation to the actual Moon, we simply use this symbol in heliocentric coordinates. Remember that this aspect takes place approximately once in 10 years. 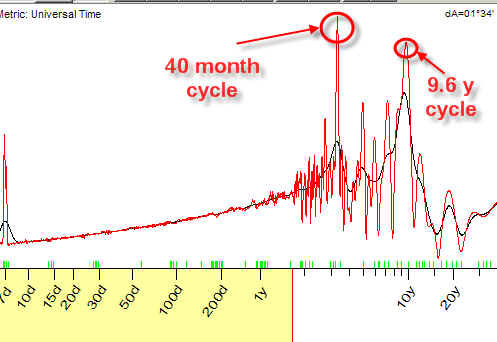 For me this fact is very interesting because for years I try to find some rational explanation to 9-year Juglar cycle.